Set in the titular Transylvania writer and director Tony Gatlif's 2006 Transylvania begins with Zingarina (Asia Argento) a French woman travelling into rural Transylvania to find her musician boyfriend Milan (Marco Castoldi) who has suddenly left France for his home. Her French friend Marie (Amira Casar) travels with her along with their interpreter. Gatlif depicts aTransylvania that hardly seems touched by the modern Western world. Nearly every scene is laced through with traditional, often gypsy music as Zingarina searches for her boyfriend. As the story unfolds, Zingarina sheds more of her original identity and gradually takes on the persona of a Transylvanian gypsy once she detaches herself from her concerned friend Marie and begins to travel with Tchangalo (Birol Unel). Tchangalo is a virtual gypsy, travelling around the countryside making his living pawning goods from loved ones. Asia Argento gives a brave performance fully committing to the mental break down that gradually consumes Zingarina. 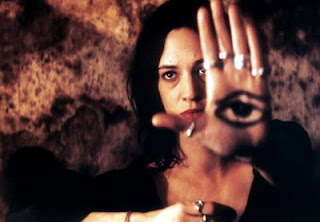 The symbol of an eye to ward off the Evil Eye permeates the film with Zingarina drawing it on her hand and wielding it against those she comes to mistrust. Gatlif's Transylvania in winter time is categorised by cold, hunger and poverty all the while with musicians, often literally following the characters around. The film takes on a near fairytale quality with Gatlif reflecting the unusual nature of Transylvania or alluding to Zingarina's loss of grip on reality. As a result the story includes scenes of manic dancing, a gentle exorcism and experienced peasants assisting at a birth while music is frequently being played live. With it's mix of languages, cultures and identities Transylvania appears to have things to say but what the director is trying to put across to an audience becomes somewhat lost in the mix. The music, if one is not a fan of traditional Transylvanian music can grate after a time. There is not a clear resolution to the story and many may find themselves ultimately searching for the point of the film. The Bloggies Film Awards: The Winners! The Blob Vs The Thing: Who Would Win In A Fight?